While evapotranspiration (ET) can be directly “measured” at a particular location, the methods of doing so are expensive and only applicable for locations meeting certain strict criteria. For example, one can use the eddy covariance technique, which uses high frequency measurements of the variations in vertical air motion and humidity to determine ET. Eddy covariance instrumentation costs tens of thousands of dollars, analysis of the data is highly specialized, sites must be fairly flat, land cover must be uniform, and the results are representative of only a small area. To map ET over varied terrain with contrasting land cover types and steep gradients in climate, it is necessary to use models to estimate the important processes involved, and to make use of the spatially-extensive data provided by satellite-borne sensors. In this work, we employed a widely-used model for estimating ET, developed by H.L. Penman and J.L. Monteith (Penman-Monteith Model). 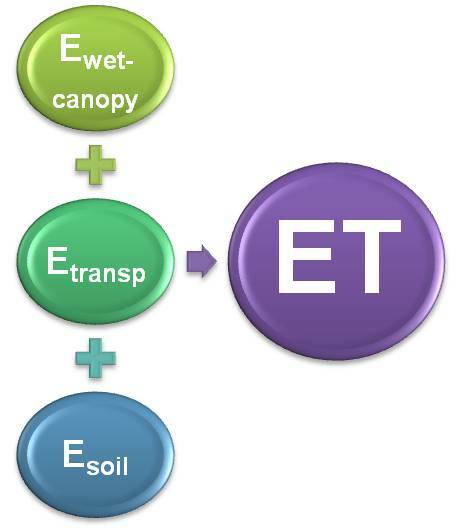 The model was applied separately to the three components of ET: wet-canopy evaporation (evaporation of water from the outside of rain- or fog-wetted plant leaves and stems), transpiration (the evaporation of water from the interior of leaves through the tiny openings in the leaf surface called stomata), and soil evaporation. After estimating each, the three components were added together to get ET (shown on right). The Penman-Monteith model is an equation that incorporates variables such as solar radiation, air temperature, humidity, wind speed, and parameters describing the surface conditions related to the type of vegetation, soil, and availability of water. Each of these variables had to be estimated at each 250 x 250 m (820 x 820 ft) grid for each hour of each month (12 x 24 = 288). In all, more than 40 variables were mapped. Stomatal Control - the characteristics of the plant species that control the exchange of gases through the plant leaves’ stomata. The key variable in the energy term of the Penman-Monteith equation is Net Radiation. Much of the work done in this project went into estimating this variable. 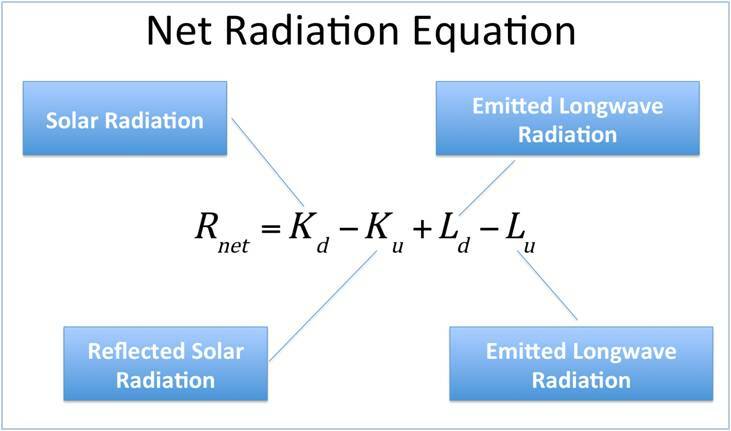 Net radiation has four components (see the equation to the right), each of which had to be mapped for each time interval (24 hours x 12 months). 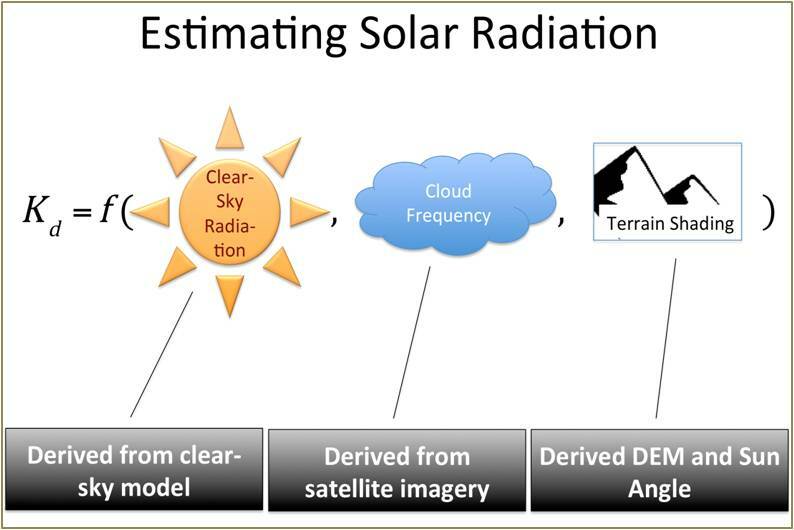 The most important component of Net Radiation is Solar Radiation, which has distinct diurnal, annual, and spatial patterns related to sun angle, atmospheric clarity, and cloud cover. We mapped solar radiation by first estimating clear-sky solar radiation, which is the amount of sunlight received with no clouds at a given location, time of year, and time of day. Then the effects of clouds and shading by surrounding terrain were incorporated to produce maps of solar radiation. We analyzed patterns of cloud frequency based on imagery from the MODIS and GOES satellite platforms. The proportion of incident solar radiation reflected by the surface is determined by the sun angle, the relative amount of diffuse radiation, and the characteristics of the surface. We focused on capturing the seasonal variations in surface characteristics by using data from MODIS product MOD43B3 to characterize the spatial patterns of surface albedo (the ratio of reflected to incident solar radiation) for each month. To obtain albedo estimates at high spatial resolution, we used the MODIS data to determine monthly albedo values for each land cover type and mapped albedo based on the land cover distribution. Reflected solar radiation was then calculated as the product of albedo and solar radiation. In addition to incident and reflected solar (shortwave) radiation, we must also account for downward and upward longwave radiation. The wavelengths of radiation are determined by the temperature of the emitting body; the hotter the emitting body, the shorter and the wavelengths of the emitted radiation. Radiation in our environment comes from either the sun or from some part of the earth system, including the surface, clouds, and air. The sun, of course, is very hot compared with the earth and emits radiation with shorter wavelengths. Therefore, solar radiation is called shortwave radiation and radiation emitted by any part of the earth or the atmosphere is called longwave radiation. Although it is invisible to human eyes, large amounts of energy are exchanged between the earth’s surface and the atmosphere via longwave radiation. We estimated downward longwave radiation as a function of air temperature, humidity, and cloud frequency. Upward radiation emitted by the earth’s surface is mainly a function of the surface temperature. We used air temperature to estimate the pattern of surface temperature from which we calculated upward longwave radiation. Mean relative humidity was mapped for each hour of the diurnal cycle of each month as a function of elevation. First, functions were fit to station data to represent the vertical changes of minimum and maximum relative humidity with elevation. 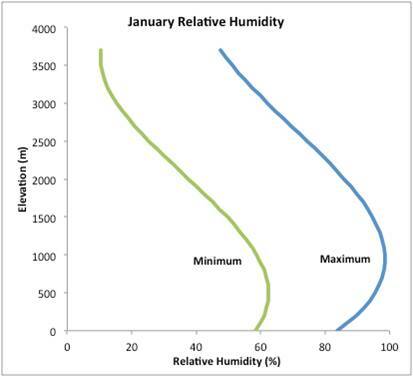 As an example, the January profiles of minimum and maximum relative humidity are shown at right. Based on the minimum and maximum, the 24 hourly relative humidity values were estimated using a sinusoidal function. 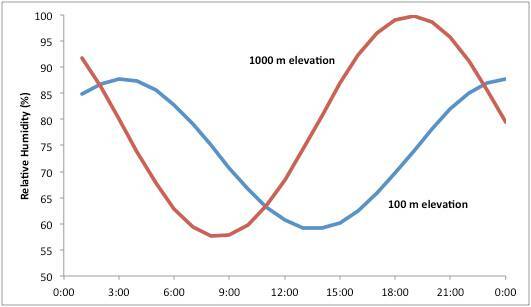 The January diurnal cycles for elevations of 100 and 1000 m are shown in the graph to the left. 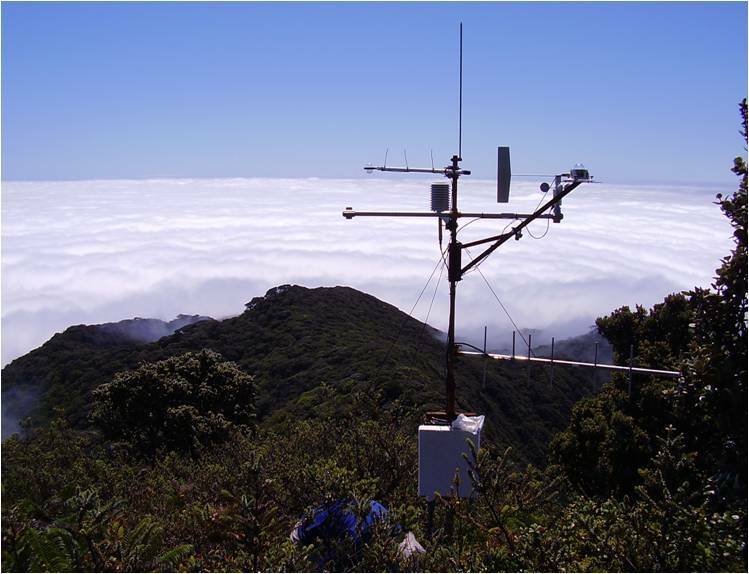 Monthly maximum, minimum, and mean temperatures were estimated as functions of elevation, within an assumed two-layer atmosphere separated by the trade-wind inversion (assumed to be at a height of 2150 m), and rainfall. 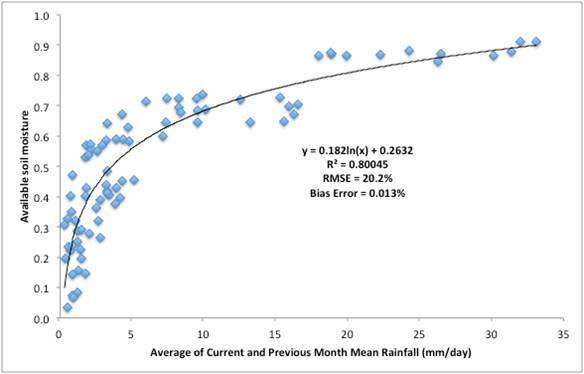 At right, January maximum, minimum, and mean temperatures are shown as a function of elevation for mean annual rainfall of 500 mm (solid lines) and 1000 mm (dotted lines). The mean annual wind speed map developed for Hawai‘i by AWS Truewind was used in this study. Using their map of wind speed at 50 m above the ground, we adjusted it to a reference level of two meters above the vegetation. Using stations data from HaleNet (photo on left shows the HaleNet Treeline station at 2260 m elevation on windward Haleakalā), we found the month-to-month differences in wind speed did not follow a consistent pattern. However, the wind speed does differ strongly according to time of day, but with differences that depend on elevation. We used that information to develop 24 hourly wind speed maps, applicable in all months of the year. Based on Monin-Obukhov similarity theory, we estimated the effects of varying levels of buoyancy on the effectiveness of turbulent eddies in transporting heat and water vapor vertically in the atmosphere. 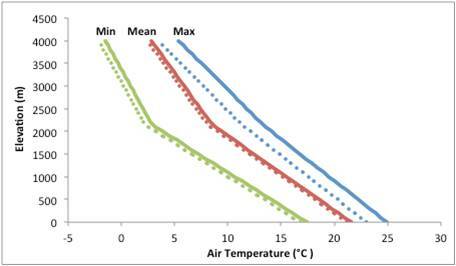 The stability parameters used in the calculations were estimated based on air temperature, wind speed, the roughness of the vegetation, and other variables. Available soil moisture, the relative amount of water in the soil between a lower limit, called the wilting point, and an upper limit, known at the field capacity, was estimated from the mean monthly rainfall of the current month and the previous month. A functional relationship was established based on observed and modeled soil moisture and rainfall. Separate functions were developed for undeveloped, irrigated agriculture, and urban areas. At right is the function for undeveloped areas. Soil moisture constraint factors were used for estimating transpiration and soil evaporation to account for the effects of available soil moisture on these variables. Photo by T. Giambelluca, 30 June 2012, Mt. Ka‘ala, O‘ahu, Hawai‘i. When leaves are wet, evaporation occurs from the water on the outsides of leaves, branches, and stems. For most plants, transpiration is negligible under wet leaf conditions. By separately calculating wet canopy evaporation, the special conditions associated with wet versus dry vegetation could be represented. To make this distinction, it was necessary to estimate the fraction of time that the vegetation is wet at a give location for each hour of the day and each month of the year. Maps of canopy wetness fraction were developed using a statistical relationship between average canopy wetness, derived from leaf wetness sensor data measured at eight sites, and relative humidity. When the ground is completely covered by vegetation, soil evaporation is very limited. 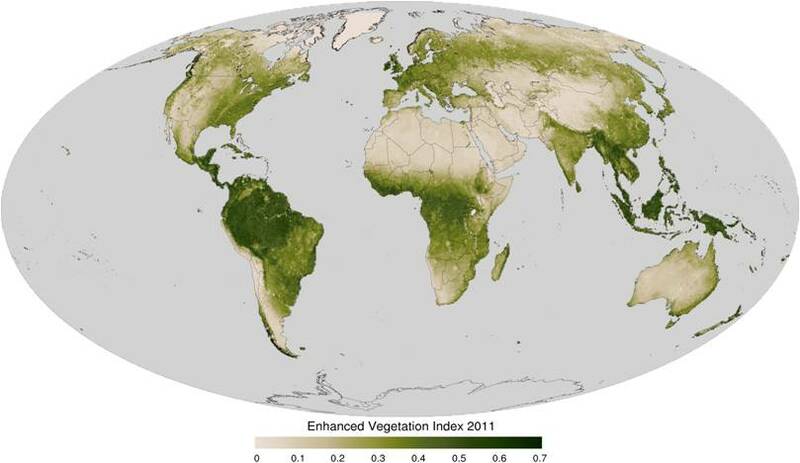 Conversely, when vegetation is absent, transpiration and wet-canopy evaporation are zero. 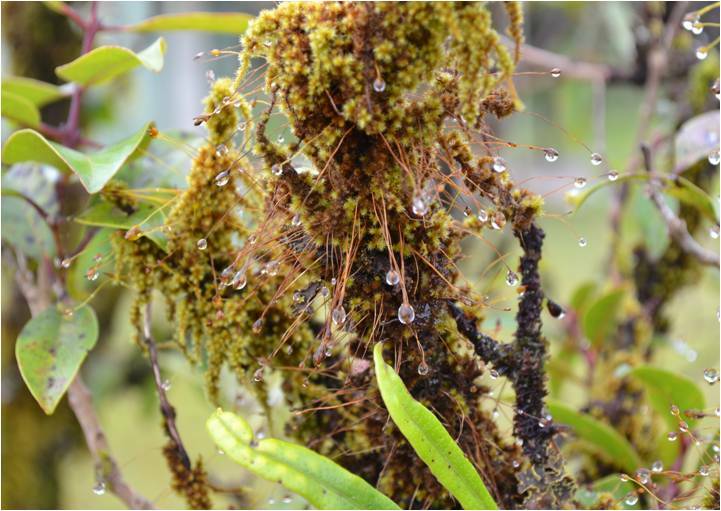 Transpiration, wet-canopy evaporation, and soil evaporation have different controls. To distinguish between processes associated with water loss from vegetation and those associated with soil evaporation, it was necessary to estimate the fraction of the ground covered by vegetation, and then apply the soil evaporation model to the uncovered portion and the transpiration and wet-canopy models to the covered portion. We developed monthly maps of the vegetation cover fraction based on Enhanced Vegetation Index (EVI) data from the satellite-borne Moderate Resolution Imaging Spectrometer (MODIS). A global EVI map for 2011 is shown at right. Plants obtain water from the soil. The water is drawn upwards through the roots, stem, and branches to the leaves. There, water is evaporated from within tiny cavities, called stomata. For many species, stomata are found mostly on the bottom sides of the leaves. The opening to each stoma is controlled by a specialized pair of cells (guard cells). They regulate the loss of water from the plant by partially or fully closing the stomata and maintain the active uptake of carbon dioxide (CO2) necessary for photosynthesis by opening the stomata. All plants must balance the conflicting objectives of acquiring CO2, and preventing excessive loss of water. We incorporated the effects of stomatal control on transpiration by first assigning a maximum stomatal conductance to each land cover. Maximum stomatal conductance is a parameter that describes the regulation of stomata and the resulting rate of gas exchange under ideal conditions. Each plant species has a characteristic maximum stomatal conductance, a value that is known for many species based on field measurements. For each land cover type, a repesentative species (or in some cases two or more species) was selected and estimates of the maximum stomatal conductance were obtained. 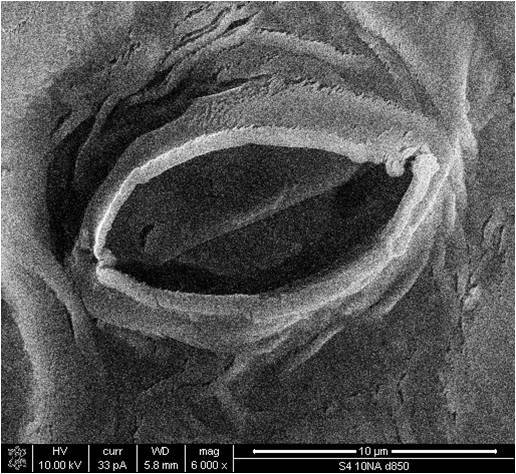 Next, the effects of the stomata for leaves under ideal conditions, i.e., sunlit, upper canopy leaves, under sunny conditions, and ideal temperature, humidity, and moisture conditions were adjusted to get a conductance value representative of the whole canopy under average, rather than ideal, conditions. Using this approach, we were able to include the effects of the spatial distribution of vegetation in the mapped evapotranspiration.